$128.5 (15 bids) (7) REED & BARTON "FRANCIS 1" STERLING SILVER SERVING PIECES NEW IN BAG NO RES. Buy: $295.0 Vintage Reed & Barton Sterling Silver Francis I Bowl X569 8"
Buy: $23.0 Reed & Barton Francis I Sterling Silver Modern Hollow Butter Spreader 6 3/8"
$431.0 (38 bids) LOT OF (12) REED BARTON "FRANCIS 1" STERLING SILVER SOUP SPOONS OLD MARK NO RES. 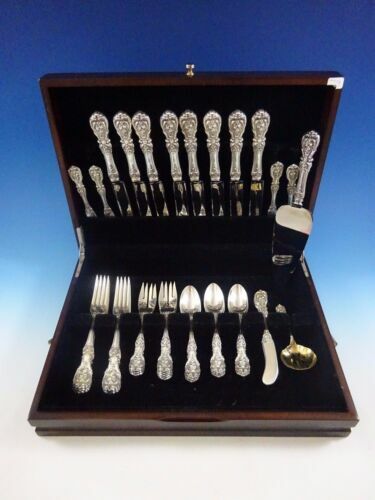 Buy: $28.0 Reed & Barton Francis I Sterling Silver Hollow Handle Butter Spreader 6 1/4"
Buy: $100.0 Reed & Barton Francis I (1) Set Of Two Sterling Dinner Forks "Old Mark, Pat & H"
Buy: $30.0 Reed & Barton Francis I Sterling Silver New French Hollow Knife 9 1/8"
$34.99 Francis I Reed & Barton Sterling Round Bowl Bouillon Cream Soup Spoon 6"
$49.99 Vintage Reed & Barton Francis I Nut Dish - Excellent Condition! $59.99 Reed & Barton Francis I Fried Egg Server Sterling Silver Old Mark 9 1/2"
$454.0 Francis I by Reed & Barton Ice Serving Spoon, Sterling Silver, 9 5/8"
$450.0 Francis I by Reed and Barton Sterling Silver Macaroni Server 10 1/2"
$7.0 (3 bids) Beautiful Antique STERLING SILVER Handle Dinner KNIFE by Reed and Barton!